The picturesque resort town of Pomorie is located on the southern Black Sea coast of Bulgaria – easily reached from the airports at nearby Burgas. It’s a popular destination for summer breaks thanks to the region’s beautiful golden beaches, in addition to numerous salt lakes, the healing clay sanatoriums, and huge local vineyards. 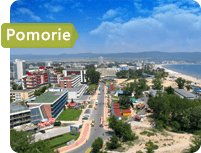 If you’ve chosen Pomorie as the destination for your summer holiday in Bulgaria, then be sure to talk to the friendly experts at AroundBulgaria before you travel! In addition to knowing the area inside out, we’re able to provide some of the most efficient and affordable taxi services in Pomorie and the surrounding region. Need to get somewhere else during your visit to Bulgaria? Our taxi service can take you anywhere you want to go in the country. Whatever you’re planning to do in Bulgaria, we can offer a service that fits your needs – from tourism, shopping and beach trips through to getting you to your next business conference. For your convenience, we offer a 24/7 booking service – allowing you to arrange a taxi for any time of night or day! We can cater to all kinds of service thanks to our broad selection of vehicles, including minibuses, vans, SUVs and professional cars. Our passengers are always covered by our comprehensive vehicle insurance policies. If you’ve brought large items such as sporting equipment with you, we’ll be happy to provide a roof rack. We can also offer children’s car seats for those travelling with the kids. Look forward to enjoying full Internet access during your taxi service – all of our cars are wifi ready. For the sake of comfort, you’ll be able to set the temperature and music just the way you like it. We keep our cars and minibuses perfectly clean throughout, and free from smoke. Other Local Taxi services: Kiril taxi. Book your Taxi in Pomorie Now! Simply give us a call today, to make arrangements for your efficient and affordable taxi service in Pomorie. Our friendly advisors are ready to talk about your transport needs – we can charge either by time or by distance, depending on which is likely to work the best for you. As soon as you’ve settled on a price, it will be fixed… so you won’t have to worry about price raises, hidden fees or additional charges later on. We’ll never ask for advance payments, either. Instead, you can pay your driver directly on the completion of your taxi service. For your convenience, we can accept payments in a range of different currencies – including Bulgarian Levs, US Dollars, Euros and even Russian Rubles. There are also some fantastic special offers open to customers booking more than one trip with AroundBulgaria. If you’re planning an airport transfer, a day excursion, a taxi service or any combination of those, then be sure to ask your advisor about our special discounts for returning customers! For all questions, or to make a booking now, simply give us a call – and talk to the team at AroundBulgaria for all your Pomorie taxi needs! The busy Bulgarian town of Pomorie has reflected the incredible colorful nature and culture of the whole country throughout its existence. These features are most resplendently displayed in the Old Town – an area that charms all tourists. The boulders covered coast which juts out into the sea in several places, is one of the resort’s most famous attractions. From hotel windows there are incredible picturesque panoramas unfolding before the eyes, and on the well-manicured beaches tourists can enjoy the grayish tinted stone and the expanse of the sea. Pomorie is a slice of paradise on Earth, amid pristine natural surroundings and numerous historical and architectural monuments. The nearest airports are Burgas Airport and Varna Airport, and it is possible to reach them by bus in 20 minutes. The transport system is excellently developed, and tourists can conveniently travel not only around the town but also outside it. Hello, I would like to share what my exciting personal experience was, express my gratitude to the employees of AroundBulgaria.com. Last year, at last, my husband and I managed to allot some time for a vacation in Bulgaria. My friend who was just back, pleased after a Bulgarian vacation, impressed with the taxi services of AroundBulgaria.com, gave me the phone number, so that I could contact and book with the company. We arrived in Varna. The booked car was already waiting, and the driver’s offer to help us carry the baggage was a nice feature of the service. The passenger compartment offered supreme comfort, and most importantly, it was pleasantly cool. We were due to reach Pomorie, we reached without noticing the time. Pleasure after pleasure followed, we paid a very low rate, which certainly pleased us very much. After a week’s vacation we used the same company’s services again, the return transfer was of equal exceptional level, too, and we were even made more pleased: they gave us a discount.